Anya is a scrumptious salad potato from the Albert Bartlett range. It is perfect for salads on a warm summer's evening! So good, it has won awards -very easy to grow and is loved by gardeners of all abilities. Now you can grow your own too - even in pots on your patio. Supplied from Certified Seed from some of the UK's leading growers. Anya is a scrumptious salad potato from the Albert Bartlett range. Top-chefs love it for its simply wonderful flavour. It is perfect for salads on a warm summer’s evening – simply boil your potatoes up and add a knob of butter and some freshly chopped chives – yummy! So good, it has won awards – Albert Bartlett Anya is very easy to grow and is loved by gardeners of all abilities. Now you can grow your own too – even in pots on your patio. 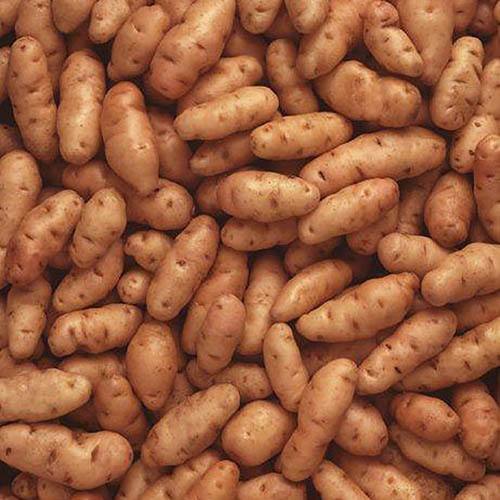 You’ll be picking the attractive long, pink potatoes around eight weeks after planting. Supplied from Certified Seed from some of the UK's leading growers, We suggest "chitting" by standing round end upwards in egg boxes, in cool, light room for 2-3 weeks, until small shoots emerge from the eyes.